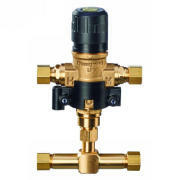 The UMV500-LF Universal UnderSink Thermostatic Mixing Valve is intended for use in under counter and under sink applications to prevent accidental scalding. The UMV500 Universal model is designed to be used as a three port design (touchless sink) or a four port design (two handle sink) with the addition of the 4 port adaptor (included).The outlet water temperature must be properly adjusted by the installer using a thermometer to measure the outlet temperature at the faucet. A maximum outlet temperature of 110 F (43 C) is recommended. Universal design allows flexibility in adapting to three port or four port applications. Shipped with four port adapter. Shipped with standoffs for easy mounting. Integral check valves in hot and cold inlets. Lockable hand wheel for tamper resistant temperature setting.